Buswells is an elegant, three star hotel, located in the heart of Dublin City. A charming, 67 bedroom Georgian hotel, Buswells is just a short stroll from many of the capital city’s main attractions, including Trinity College and St Stephen's Green. Buswells Hotel is a historic, yet modern, three star accommodation that comprises five Georgian townhouses in the heart of Dublin’s business district, making it the perfect choice for both tourists and business people. In each of the guest rooms, visitors can enjoy complimentary WiFi, plasma TV, direct dial telephone and 24 hour room service. Additionally, rooms are fitted with an iron, ironing board, hair dryer, bottled water and tea and coffee making facilities. All Buswells guests have access to a small on-site gym. The hotels cosy bar serves a wide selection of beverages, including, locally sourced craft beers or choose from our extensive snack menu whilst relaxing in our sofa or morning room. Just steps outside the hotel, visitors can discover the National Library, National Museum and Trinity College, while a five minute stroll will take them to the chic shops of Grafton Street, the beautiful scenery of St Stephens Green or the fine art of the National Gallery. 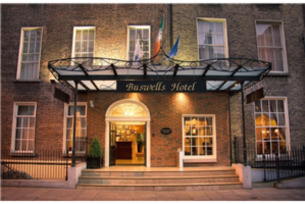 Buswells has been operating since 1882 and is one of the oldest hotels in Dublin City. In 2010, the hotel earned its third Green Fáilte Award, recognising its dedication to eco-friendly practices.